It’s The Hardball Times Annual 2015! The 11th edition of The Hardball Times Baseball Annual is now for sale in print form. You can purchase it from either Createspace or Amazon, and it will soon be available in Kindle format as well (we won’t be doing a Nook version this year). The book is a labor of love for our editors–Joe Distelheim, Jason Linden, Greg Simons–and for me. And of course, for Dave Studeman. This is Studes’ 11th and final year working on the book, and as such, we really blew it out. Normally, the Annual clocks in around 300 pages, but this year we went a little bit crazy–400 pages, a full 33 percent more book. And all at no additional cost to you, the reader; the book is the same $15.99 that it has been. We have a great stable of writers this year, drawn mostly from within the FanGraphs and THT family, because let’s face it, we have a great stable of writers right here. One note before we break things down–we are going to leave this link in the sidebar on the homepage for the foreseeable future, and we encourage you to add your comments on the book in the comments section below. We get your great feedback on our articles each and every day, but we don’t always know how you feel about the Annual. So let us know here! Division reviews by Alex Skillin (AL East), August Fagerstrom (AL Central), David Wiers (AL West), Alex Remington (NL East), Greg Simons (NL Central) and Dustin Nosler (NL West). We took a different approach with these this year. Instead of being specifically team focused, they tackle the 10 biggest stories/players/games from each division. Studes’ take on WPA in 2014. A must read every year. Brad Johnson’s take on the postseason through the lens of ChampAdded. John Paschal inherits “The Year in Frivolity” mantle from Craig Calcaterra. Jeff Sullivan looks at whether or not sabermetrics have tipped the balance of power toward pitching and defense. Do NOT miss this one! The always amazing Craig Wright looks at the explosion of UCL injuries. Jason Linden wonders which book was more influential in major league front offices, Moneyball or The Book, and surveyed front office personnel for clues. Eno Sarris interviewed just about all living, breathing ballplayers to find out whether the split-fingered fastball is dangerous. Mike Petriello puts Ned Colletti inside our GM in a Box. Miles Wray examines the short-term gains and long-term pains of recruiting players in the Dominican Republic. Jack Moore looks at the role of baseball’s commissioner and how it has changed. Neil Weinberg, Karl de Vries and Bradley Woodrum give Phil Hughes, Jay Bruce and the Cubs’ young hitters the case-study treatment. David G. Temple looks at the feelings Twins fans have had for Joe Mauer over the years. Carson Cistulli details his process for his unique take on prospect analysis. Dave Cameron shows us how the economics of the game have changed. We have two pieces that serve as companions from Steve Treder and Tony Blengino, and three other great pieces. Steve Treder on the ascension of the strikeout, and specific thoughts and ideas about what can be done about this legitimate issue now facing baseball. Tony Blengino revels in the strikeout, awarding a championship belt for the most powerful pitcher for every year going back to 1901. Frank Jackson details the rise of Arizona State University’s baseball program, as well as the early days of the College World Series. Warren Corbett armed himself with some unpublished Retrosheet play-by-play data to look at the longest game in history, a 26-inning affair between the Dodgers and Braves in 1920. Bill James searches for the winning combination. That’s essentially a whole book right there. But we still have another section to go! Here we have our customary great research, where writers dig in on some meaty topics. Jeff Zimmerman puts those other shifts–the infield in, charging for bunts and the no-doubles defense–under the microscope. Do they work? Some great research here by Jeff. Shane Tourtellotte examines whether catchers hit the wall and fade late in the season. Chris St. John has some unique data on home runs and fly balls, with two very pretty graphics. Matt Swartz looks at the ramifications of players buying insurance instead of agreeing to long-term contracts. Matthew Murphy re-examines his study from earlier this year on how teams take advantage of relievers during the arbitration process, with some new findings. Matthew Carruth develops a metric to find out just how often a pitcher confuses the batter. David Kagan breaks down the physics of pitching in the wind–no matter where it’s blowing from. Alan M. Nathan explains the physics of metal vs. wood baseball bats. Jesse Wolfersberger and Matthew Yaspan examine recency effect. Carson Cistulli checks in with his annual leaderboards. Dave Allen and Kevin Tenenbaum lay out a theoretical blueprint for improving MLEs. So there you have it. We’ve been very excited about getting this book to you, and now, the wait is over. You might not be interested in all of these topics, but within these 400 pages, you’re going to find something that you like. 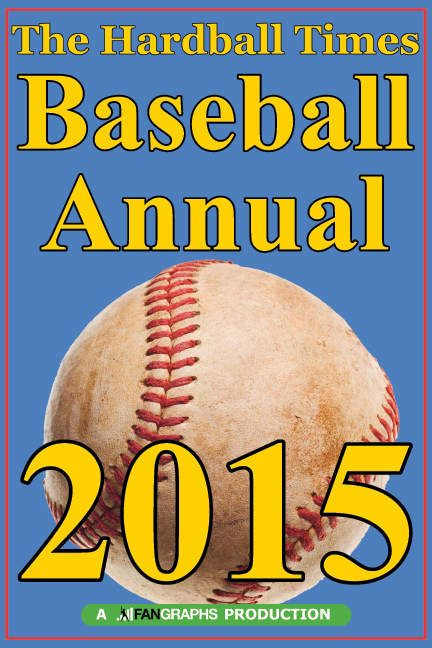 Start your winter off right with a copy of The Hardball Times Baseball Annual 2015! Thanks for editing it Paul. Looks great! When will the kindle version be available in the UK? I go on holiday on Sat and was hoping to take it with me! Probably not by Saturday, unfortunately. My apologies. Hope you enjoy your holiday though! Yikes, this is my alarm bell to finish reading the 2014 book! La carapace sociale a sautÃ© – conscience de l’athÃ©e.Le champ est ouvert – le mal se dÃ©ploie, condition nÃ©cessaire Ã l’exercice de la libertÃ© – alors fuir ?Le pÃ¨re est un Stalker: il guide son fils.Combats, Force-Sud est l’ haltÃ¨re-idÃ©e jusqu’Ã l’altÃ©ritÃ© finale, sableuse qui est l’argile de la fin et du dÃ©but de l’homme, ici.Ã©ric etienne. when can we expect the 2016 version of hardball times annual? hey bobby, countdown is on. definitely before thanksgiving. This shows real exipetrse. Thanks for the answer. Great report! Thank you very much. What frame size was your test-bike? Would you (your size is 5′ 10″, right?) choose 18 oder 19,5 frame? Comme pour Trayvon Martin, la pression de groupuscules communautaristes, racistes et extremistes conduit a une justice a 2 vitesses: haro sur le droit et la justice, et consecration, celebration infantile et aveugle de la racaille.Degoutant et pathetique. I remember one Catholic analysis of Harry Potter that was far more worried about the whole Muggle/wizard divide — the elitist effect of such a group. Indeed, it called the effect Gnostic.Personally I find the special snowflakes who can do magic trope rather annoying myself. Ã„h ja, da war mal was. Meine Kollegin hat immer sehr unter den Konzertbesuchen als Begleitperson fÃ¼r ihre Tochter gelitten.Ich merke gerade, dass ich schon Ewigkeiten keinen Dudelfunk mehr gehÃ¶rt habe. Das ist der Nachteil, wenn Kind und Sohn mit einem Geburtstagsgeschenk dafÃ¼r sorgen, dass man mit entsprechender MP3-Musik ausgestattet ist. Definitiv nicht NKOTBSB.GrÃ¼ÃŸe! N.
This’ll be my first time reading this. I’m extremely excited!